Total Tolls: dang! I forgot to total these up. I do have receipts though, so I’ll try to update this post soon with that info. Total Gas Costs: Sorry, I forgot to keep track of this. No receipts either. Driver: Me, the entire time. 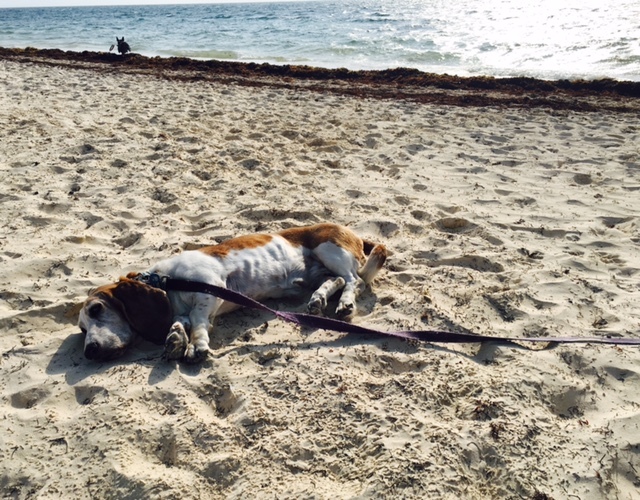 Pets: 2 dogs: Sadie the Boston Terrier, and Bessie the Basset Hound. Before we left, we mapped each leg using Google Maps, and printed it out, so that we had an actual hard copy. Also before we left, I mapped out our trip using the Maps.Me app. What’s nice about Maps.Me is that you can download the maps for offline use. So I was able to keep my iPhone in airplane mode during the drive, and the GPS still works, and Maps.Me worked perfect! The only downside seemed to be its time calculations. Those are totally wrong. For example, 200 miles to go, and it said it would take us 10 hours. Or 60 miles to go, and it would take us 1 minute. So we just knew just to ignore its time estimates. Overall I was very impressed with this app as an offline maps app. When we got into tricky situations, like when we got off course in Puebla, we turned on Cellular Data and used the Waze app, which guided us exactly where we needed to go. Waze is my normal go-to mapping app, but since we’re no longer on an unlimited data plan, it was nice to have maps.me for offline use, and just use Waze when we needed it. Transmission: Automatic with overdrive. I turned off the overdrive for the entire trip. This makes a *big* difference. Trailer weight (full): Not sure, but I’m pretty sure we were over 2000 pounds. Especially with my tools, and all the dumbbells and kettlebells! On good highways, I kept it about 65 miles per hour. I never went about 70. The Jeep seemed happy there. It pulled great, even through the mountains. And I felt comfortable passing other cars and trucks on the highways. The braking felt good, and never let me down. I did drive with some caution though, and kept my distance from other cars, and didn’t have to do many hard stops. Engine temperature stayed perfect at 210 most of the way, Occasionally, it peaked just above that when climbing through the mountains. We ran the AC the last 2 days, and it didn’t affect engine temps at all. I did do a bunch of preventive maintenance before I left. I took it to my mechanic, told him about our trip, and said we wouldn’t likely have a great mechanic for a couple years, so take care of anything that it might need. Oil change, AC hoses, vacuum hoses, brakes, etc. It cost me a few bucks, but the peace of mind was worth it. In short – my Jeep is awesome! I freakin’ love my Jeep! A few people have asked me about security, especially for the trailer. 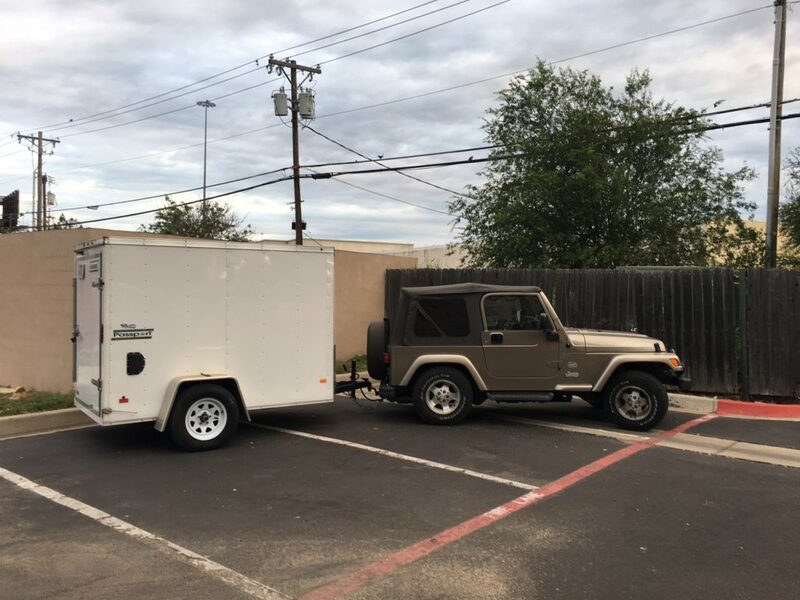 At each hotel we stayed, I felt completely safe with the Jeep and trailer. Each hotel had great parking, and the 3 hotels in Mexico all had gated, protected lots. I installed a hidden cut-off switch inside the Jeep, so it can’t be started unless the switch is on. So that’s a wrap on our road trip. We’re now in Puerto Morelos, so we can move on from the road trip phase to the living in Mexico phase! More posts to come! After a long trip, we’re all exhausted. Time to enjoy the beach! Did you have to remove anything or just show your inventory list? Declared anything to customs ? Any Tips to anyone like border agents? And Which Mx auto ins. did you decide to go with? We had copies of everything – car titles, marriage certificates, passports, drivers license, pet health certs, etc. I think I had at least 3 copies of everything. I wanted to be prepared, and I figured it was much easier to make a bunch of copies of everything in the US. We didn’t end up needing most of these copies, but it just gave me one less thing to worry about and be prepared for. We had to empty about half of our trailer. We declared all of our stuff, and we did have too pay a tax/fee/duty. We didn’t have to “tip” anyone at the border. But we did have to pay 200 pesos to a Merida cop. Hope this helps – and good luck in your journey! I absolutely loved this article and after reading it am once again contemplating driving to Cancun versus just buying something there. We will be moving there in the next few weeks, and I keep dwelling on this subject. I have a 2000 Ford F-150 that’s in great shape and could definitely make the 2200 mile trip (out of Fort Worth), but, still don’t know if it’s worth it. My wife said that there is no way that she’ll let me do it alone, so what’s your opinion on this? Also, how did you pay at the toll booths, if they had them? Pesos or US? Thanks for stopping by, and for the nice comments! One of the things to consider in your decision is your visa status. Are coming in on a tourist visa, or temp or perm residency? If perm, it’s a bit more difficult to keep your vehicle legal, as we’re not supposed to drive foreign-plated vehicles. If temp, your TIP would renew with your visa, so you could drive your car here for the next 4 years. So what options are you considering? * driving your truck down alone? * driving your truck down with your wife? * selling the truck in TX and flying down? For the tolls, we paid in pesos. We had pesos from our last trip to Mexico, and then on our first night in Mexico, we got pesos at the ATM. You’ll definitely want to take the toll roads whenever possible. We are coming in on a tourist visa but are in the process of getting our temp (we hired an attorney for this since we are planning on opening up a business in Mexico). All three options you referenced are what I’m considering, even though as mentioned, my wife is already telling me that I will not drive it alone. Obviously if we sell it, we’ll need to buy something in Mexico, and the more I think about this, I feel that that is probably our best option. If you have the option of selling your truck in the US, and just flying here – I think that’s a good option. For us, we had the dogs, and since we were driving, we decided to also bring a small trailer full of our stuff. But, if hadn’t had the dogs, we probably would have sold everything, flew here, and started completely anew. Excellent article…very informative! I am curious though as to why you chose to cross at Laredo vs Brownsville? I am relocating from the San Diego area to Boca Del Rio, Veracruz this summer. 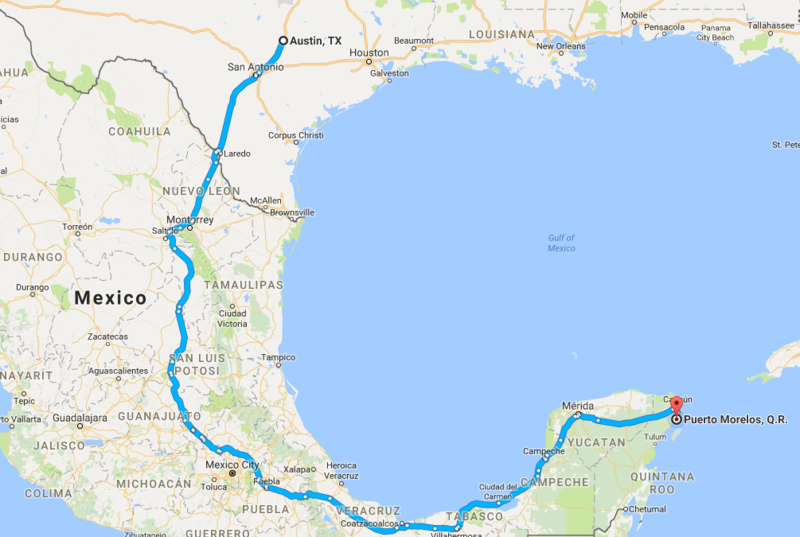 It seems that Brownsville to Tampico would be a viable option and a little shorter. Granted you saw a lot more of the country taking the route that you did…but were there safety concerns, etc? Best of luck! I did a lot of research on border crossings, and the overwhelming consensus from those who have done it in the past was that the crossing at the Colombia bridge in Laredo was the easiest, and it put us on the path of safer and better roads. Hola! How did you know if the hotels had secure parking lots? I can’t seem to find that info. At the Las Palmas Midway Inn in Matehuala, although it wasn’t a gated area, you can park right next to your room, so it felt secure. At the InterContinental Presidente in Puebla, there was a large gated area where I was able to park with the trailer. And that area is clearly visible from the front door where the valets are, so I didn’t have any worries. At the Hilton Villahermosa, they have tons of parking, and it’s all inside a gated area with an attendant. So parking the Jeep and trailer was no problem at all, and it was completely safe. At all 3 hotels I felt completely safe with the parking situations.